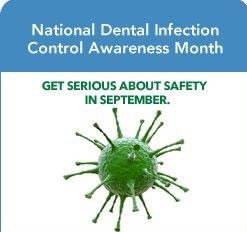 September is National Dental Infection Control Awareness Month, which highlights infection control in dentistry. 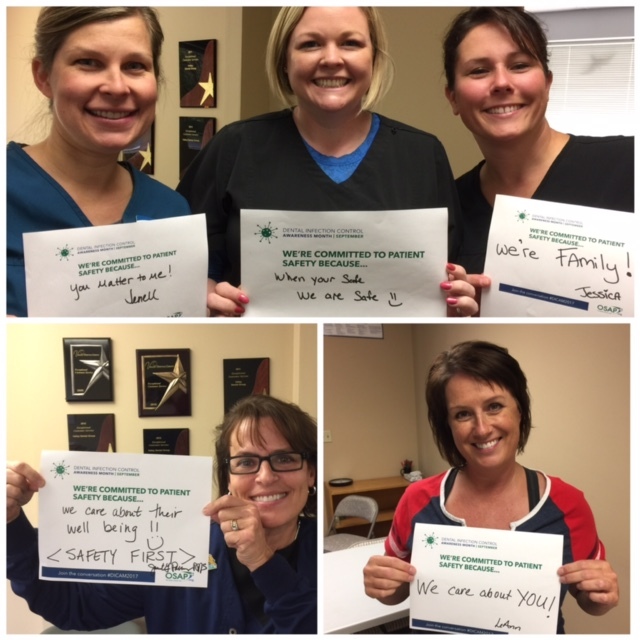 Infection control is one of the things our office is committed to so we can provide you with safe care. We’re serious about safety. We’re proud members of OSAP, which stands for the Organization for Safety, Asepsis and Prevention. OSAP is a non-profit organization dedicated to infection control in dentistry that’s been around for over 30 years, and provides us with educational materials, updates, and training. Everyone in our office is regularly trained on infection control. We are also an accredited office with the Accreditation Association for Ambulatory Health Care, Inc. Seeking accreditation through this organization proves a commitment to on-going self-evaluation and continuous improvement. Patients sometimes worry about the risk of infection during dental procedures. We use sterile instruments, and disposable instruments and supplies that are used only for you and then thrown out. That means they have been through a rigorous decontamination process and all items are safe for use when we remove them from their sterile packs during your dental appointment. Antibiotic resistance is a real problem, but did you know that bacteria and other germs can’t resist sterilization, even if they are resistant to antibiotics? That’s why we sterilize our instruments. We wash our hands, wear new gloves and masks for each patient, and we make sure work surfaces are cleaned and disinfected between patients. We use disinfectants to make sure surfaces are clean, but we also use surface barriers, such as plastic sleeves, for surfaces that are hard to clean, like switches on dental chairs. We use hospital-grade cleaners and disinfectants. Ever wonder why we’ve “gift wrapped” our dental equipment? The plastic covers protect surfaces from becoming contaminated with germs and acts as a barrier. We change the plastic barriers between patients. This prevents germs from being transferred from other people to the surfaces and then to you, or vice versa. The plastic-type wrap you see over our equipment and chairs is just another example of what we do to protect you. Our office promotes a culture of safety. In dentistry, and healthcare in general, a culture of safety involves a commitment to the safety of patients and personnel by everyone in the organization. It involves individual accountability, safeguards, training, protocols, reporting, and many other elements. If you have a concern, please tell us! We are happy to explain our infection control procedures. We’re serious about your safety. This entry was posted in News and tagged dental care, dental health, Dental Safety, dentist, Infection Congtrol. Bookmark the permalink.